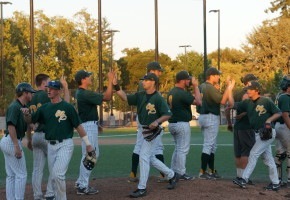 Coming off a successful campaign in the summer of 2013 during which they finished third in the Far West League and only one game from the championship, M-A grad David Klein and the Menlo Park Legends were poised to take the California Collegiate League by storm. The Legends, along with the Neptune Beach Pearl, the Walnut Creek Crawdads, and the Pacific Union Financial Capitalists, combined forces to add a new division to their new league at the end of 2013, and the 2014 season offered the newcomers a chance to prove themselves in one of the more competitive summer collegiate leagues in the country. In the end, the Legends finished fourth in the CCL North with an overall record of 14-31, 11-21 in league play. Menlo Park prepared for the season by constructing a talented roster that featured returners Logan Trowbridge, Kyle Zirbes, Wes Hoskins, Steven Miller, Dane Vande Gutche, Brandon Coborn, and DJ Sharabi, as well as a bevy of new additions to the Legends family. The Legends also found a new home in Hurley Field at Palo Alto High School due to ongoing renovations at Cañada College and a more central, easily accessible location just off El Camino Real. David Klein brought back coaches Dustin Woodward and Bill Ryan for the 2014 season and, with the help of McKenzie Campana and Michael Aronson, bettered the fan experience, adding a broadcast team and a number of improvements on the gameday operations front. Plagued by injuries to and early departures from key players like Sam Alton, Tyler Rios, DJ Sharabi, Parker Swindell, and Mark Mathias, the Legends struggled in the first half of the season, going 5-17 in their first 22 games. Their first homestand at Hurley Field provided a bright spot, as the Legends beat the Capitalists 7-0 in the opener then two days later won their second contest of the year against the playoff-bound Neptune Beach Pearl. Despite the early success at home, the Legends’ first half established what would prove to be a season-long theme of hard-fought one-run losses, which made up an incredible 16 of the Legends 31 losses on the season. On average, Menlo Park’s losses were decided by just 2.94 runs, a stark contrast to the 5.07 run margin by which they claimed their victories. Although the one-run defeats continued to be an issue, the Legends showed considerable improvement in the second half of the season, going 9-14, 7-10 in the CCL. 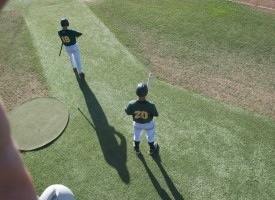 Many of the second half losses came at the hands of powerhouses like the San Luis Obispo Blues, the Santa Barbara Foresters, and the Humboldt Crabs, teams against which the Legends went a combined 0-10. However, the Legends finished on a high note, stringing together a 6-6 record in the final weeks, including victories in two of the last three games of the season. The strong finish hinted at the level of play at which the Legends were capable of playing, but couldn’t due to a variety of factors. With the 2014 summer season in the rearview mirror, Klein and the Legends have already begun looking ahead to next summer and beyond. Klein has already signed a number of players for the 2015 season and plans to gather high-energy, dedicated Division 1-caliber players for next year’s team. The Legends have grown each year, and Klein anticipates 2015 to be no exception. The Legends will definitely bounce back! GO LEGENDS!